wedding wednesday - invitations, tastings, dresses & more! Guess what folks? it's time for our weekly wedding installment!! what you're not excited about all the mundane details that go into a wedding? Well, then you've come to the wrong place today!!! for this week's edition we will focus on........well.....what I've gotten done over the past two weeks! So last week I was in a bit of a panic as I had purchased the pocket folds & envelopes and ordered the paper to create our invitations but was having a heck of a time coming up with the actual design layout! Now I am pretty decent in Illustrator but since I've been out of school I haven't used it as much and it was taking FOREVER for my memory to jog itself and get back into it. So I did what any smart woman would do. And boy did I get it! I emailed my future brother in law (a graphic designer) my ideas but knew he had other projects he was working on as well. 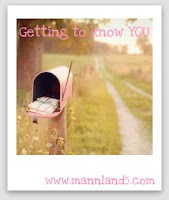 You all know I'm a sucker for these types of things so I'm playing along with Keely over at Mannland5in this week's "Getting to Know You" Because who doesn't want to know random facts about strangers???? or even your family? I know I do!!! Take the Dare..... Live the Difference!